Safe ventilation of bathrooms, toilets and shower rooms, by removing risk of electric shock in wet areas as the fan is mounted remotely. Includes 150mm shower fan, white/chrome shower light, 12V 35W dichroic lamp, 12V transformer, 1.5m PVC ducting, butterfly clips, cable ties, screws, plugs, and external grille. 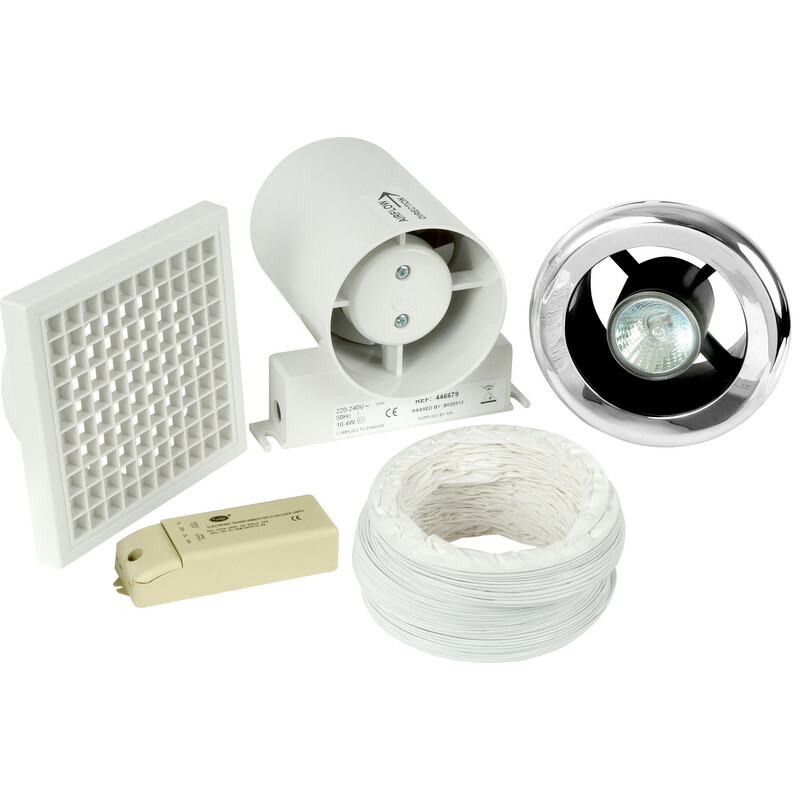 150mm Part L Inline Shower Extractor Fan & Light Kit with Timer is rated 5.0 out of 5 by 4. Rated 5 out of 5 by Kirkp from Great extract fan Great fan, despite being 50% bigger in size it is much quieter then the 100mm unit. Very easy to fit, only problem is the length of the flexible ducting as I found it short so had to buy another coil. Does everything it is supposed to do, highly recommended. Rated 5 out of 5 by Pinewood from Proper Gear As Described and expected. Rated 5 out of 5 by Scubajess from Excellent shower room extractor I bought this for use in our shower room as the one fitted was not up to the job. This in line extractor is more than adequate with its 150mm fan and ducting. Easy to fit and venting via the soffit using the supplied grill. The timer delay function is adjustable up to 30 minutes but have left ours on the default setting of 15 minutes. Really pleased.